A young female University student in the federal capital, Abuja, is offering her virginity for a sum of N350,000 to any man who can pay her the money. 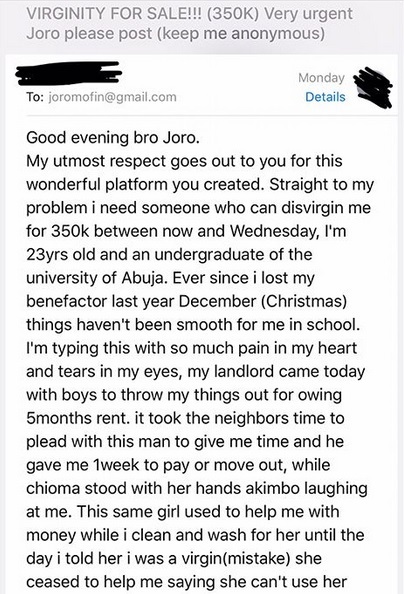 According to the young lady, ever since she lost her benefactor (a married man) who has been paying her bills and taking care of her, things have been extremely difficult for in a school and she is finding it hard to live. She revealed further that her landlord is on the verge of throwing her out of the house because her rent has since expired, adding that she is yet to pay her school fees and her final year project is starring her in the face. She is, therefore, offering her virginity for a sum of N350,000 to any man who can pay her the money.